Tricia has written a book about the most important thing, an intimate relationship with God, and some practical ways to increase, improve, solidify, and most of all enjoy a deeper relationship with Him. Tricia, through this book, has helped open a door for many, and I pray that this book gets into the hands of all the people that God intends, and tenderizes their hearts toward Him! Tricia’s book, “The Intimate God,” helps you recognize the central most important issue in your life: how you relate to God. Tricia’s easy to read book points you in the direction of God’s true heart for you. God loves you, desires intimacy with you, and wants to develop mature, Godly character in you. You can enter into an amazing intimacy with the God of the universe! Tricia shares personal stories of finding that “sweet spot” spiritually, revealing how rewarding it is to live in awareness of God’s great, unfailing love. Her book is practical and enjoyable, born out of her classes on the Prophetic, where her emphasis is that love and intimacy are the keystones to an authentic prophetic voice. I have been recommending her book to my clients who are searching for greater intimacy with our amazing God. I received this great little book as a gift. It speaks so sweetly of the Lord, and is delightfully down-to-earth and an easy, uncomplicated read. I was reminded again through it that my quiet times have not been quiet enough…. I tend to think, pray in tongues or do intercession, read, write, listen to worship with words, etc… basically get busy with doing things, and forget to just sit still in the quiet with no distractions and simply focus on Him and His beauty and greatness. If you are searching for for love, for meaning, for growth, for peace, for purpose, or in other words, just wanting to polish up your spiritual walk in order to live in a deeper relationship with God, you will find this book is a wonderful collection of personal stories plus simple truths and reminders. I loved it! This book will touch your heart miraculously because it has been anointed by our Intimate God. Tricia takes you through an amazing journey on how to hear God’s voice, know God’s love, how to rest in Him and so much more. I cherished the moments in each chapter and the time I spent soaking and journaling as the Lord revealed His heart’s desire for my life. The Holy Spirit continually confirmed what I read in this book with other Christian literature or prophetic words spoken over me. Divine appointments kept occurring which is why I know this book is anointed. I knew this was the Lord’s way of breathing life into my life’s circumstances and showing me His love. This book is a must read! Your life will be intimately refreshed and touched by the Lord! Thank you, Tricia, for walking with me through your book. I feel so blessed! I love The Intimate GOD which was given to me as a gift one evening. I got home late and decided I would read just one chapter before sleeping, but ended up reading way past midnight because I was hungry for inspiration and information on growing my relationship with God, because this is what God desires too. 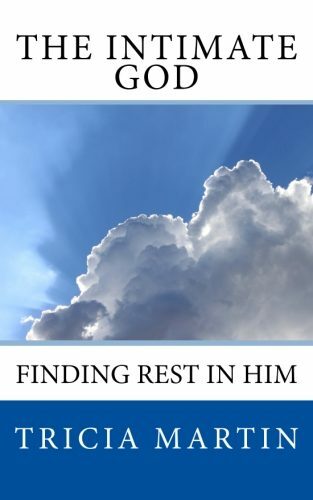 The author explains how we can practice the presence of God and intimately connect with Him regardless of the vicissitudes of life that want to steal our position of peace, joy, and rest. I highly recommend this book for anyone desiring a closer intimate relationship with Father God. Tricia Martin shares her own journey to intimacy with God. She skillfully lays a foundation through scripture, and leads the reader into the Father’s heart. She makes it so accessible and demystifies the whole process so that anyone wants more out of their relationship with God can easily follow her. I highly recommend this book! Love The Intimate God!! It is such a great way to draw closer to the Lord and know how much He cares for us! Tricia is imparting what she has personally experienced and learned in her walk with God. This book is a beautiful and touching portrayal of one woman’s journey into discovery of the heart of God. It is all about building relationships; relationship with God and community and relationships with individuals. We are all searching for answers and love but what is most needed is to unpack who we are in Christ, make relationship with Him the center of our lives, and let his love overflow from our lives into others. When we can learn to do this, life becomes a grand adventure filled with joy and unlimited possibilities. I would highly recommend this book for all who are beginning this journey, as well as those who are seeking deeper connection in their lives. I read this book in one day, it awakens your senses and your imagination to the REALITIES that are God. A very powerful and eye opening book, Tricia has done an amazing job of ushering the reader into God’s presence through her own personal testimonies and adventures with God. I highly recommend this book, It is packed full of rich knowledge and directs your heart to a restful place of contentment.